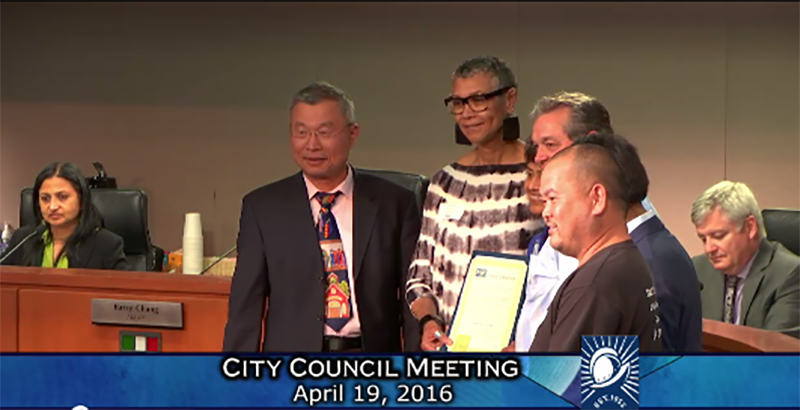 City of Cupertino Mayor Barry Chang awarded our Rethink Disposable businesses for their incredible green success recently at a city council meeting. Thanks to their participation in our program, three locally-owned food businesses in Cupertino have eliminated just under quarter of a million single-use disposable items from their operations each year, preventing over three and a half thousand pounds of trash, and saving a combined total of $10,000 annually. Those are the kind of numbers that get mayors to pay attention! We love it when our city partners recognize our program participants for their green business and waste reduction practices. You can watch video of the ceremony here. As a ReThink Disposable representative, I have talked to hundreds of restaurant owners about how they can reduce their waste by adopting our recommendations that target single-use disposable products for elimination or reduction. We now have four businesses in Cupertino participating in Rethink Disposable: JS Stewhouse, Pebbles Deli Café, Erik’s Deli Café and J&J Hawaiian. I really hope that additional Cupertino restaurants will follow the lead of these four inspirational business leaders. If environmental benefits, saving money, and having happy customers aren’t incentive enough, there’s now also the potential for mayoral and council recognition, too!